The first day of Tihar is Kaag (crow) puja / Kag puja. Hindus believe crows to be messengers of good or bad news. With its croaking, it conveys messages like visitor coming to the house. It is also believed to be a messenger of Yama, the God of death. 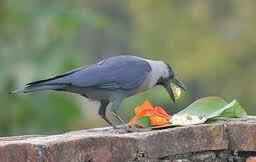 To avert grief and death in the family, Hindus worship crows during Kag Tihar offering it sweets and various dishes. In Nepal, once you leave offerings on the balcony, crow will come and eat the food. 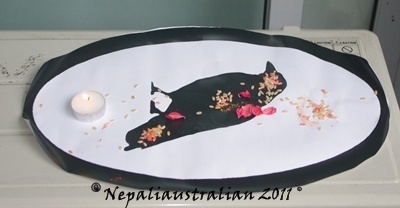 In Australia, I haven’t seen many crows around so I printed a photo of a crow and performed the Puja this morning. According to my mum, whatever you can do where you are is good enough, you just need to have faith in your belief and perform your duties as per you faith. This entry was posted in Nepali Festivals and tagged hindu, Kag puja, Puja, Tihar, yama. Bookmark the permalink.